Arena and Rated Battleground Season 12 is scheduled to end on Tuesday, March 5 (03/05/2013). 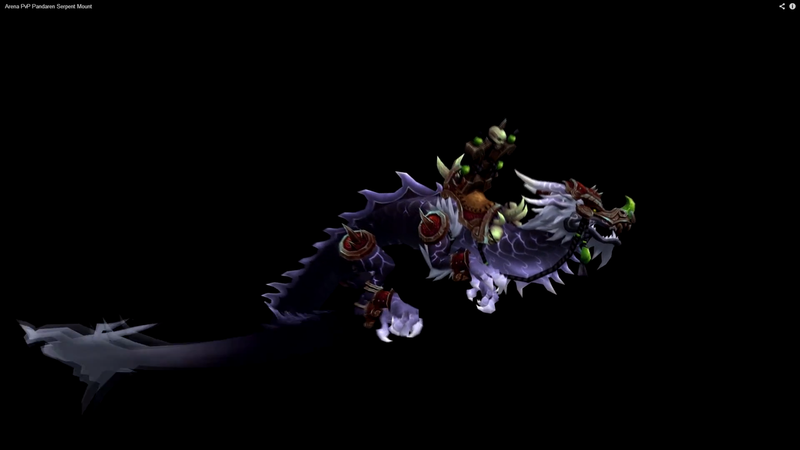 This is going to be the gladiator mount and it does NOT need Cloud Serpent riding. only top 0.5% of the 3v3 and 5v5 teams (at the end of the season) are eligible to get this mount. Also the team must have an active player (to be active you need to have 20% of the total matches played by the team, be within 100 rating of the team rating and played a total of 20 or more matches). I find it interesting that this mount is white. This was probably a deliberate choice on Blizzard's part, since white is the color of mourning in Chinese culture and is associated with death. Appropriate, given that it is a PvP reward. Invoque et renvoie un serpent-nuage du gladiateur malveillant. Cette monture peut voler. "Ces serpents-nuages ont des écailles couleur de... nuage, à vrai dire." Augmente la vitesse au sol de <ground speed>%. (When flying is available) Augmente la vitesse de vol de <flying speed>%. (When swimming) Augmente la vitesse de nage de <swimming speed>%.